Henry handed her up into his curricle before climbing up next to her. “You are certain you do not mind being seen in public with me?” He had surprised himself by worrying a great deal, as he tossed and turned on his bed last night, about how she would be viewed by the ton if it appeared he was courting her. He had not courted a lady for any noble purposes in the past. He had feigned honorable intentions, but he had only one thing in mind — capturing the affections of the young lady as far as she would allow him to capture them and her. He had never been serious in his pursuit of any lady, and that is what the ton knew. They did not know that he was a man on a mission to change his ways. Constance smiled and shook her head while a nervous flutter took up residence in her belly. 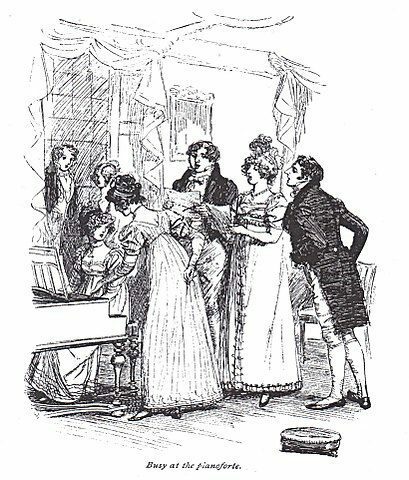 She had discussed with her aunt what the gossips might say, but her aunt had assured her that with a brother such as Trefor and Connie’s own exemplary behavior, there would be little on which the wagging tongues would be able to build their stories, save, of course, for Henry’s previous behaviour. However, Aunt Gwladys had insisted that his new behaviour and respectable ways would soon over shine all that. She tipped her head and studied the set of his jaw. There was a muscle that was twitching. He seemed genuinely nervous about where they were and what they were doing. “You are not afraid to be seen with me, are you?” she teased, causing him to cast a surprised glance her direction. The twinkle in her eye and the way her lips puckered as she attempted to keep from smiling caused him to draw a quick breath as he reminded himself of whose sister Constance was. No matter how fetching she might look, he was not to indulge his appreciation of her. “I am not afraid to be seen with you, but I am rather worried about your being seen with me. I am not the best catch of the season.” He glanced her way again. She was smiling broadly. “It is one drive,” she assured him. “You are far too good.” He saw a smile pull at the corner of her mouth, and he could imagine the sparkle that was likely in her sapphire blue eyes. “Yes, I am, but then, that is why you chose me,” she replied. So begins a collaboration between Constance Linton and Henry Crawford. One intent upon learning the ways of a respectable gent, and the other equally as intent up on seeing her student succeed. With both parties working toward a common goal, it would seem a rather open and shut case. But change is not normally all that neat and tidy. Change requires effort, and change can only become more than a desire when it is tested. It is not in the quiet, peaceful moments when all is going well when change is apparent. It’s fairly simple to act a part when nobody is questioning if your demeanor is genuine or merely a facade. However, when the clouds gather and the road becomes rutted and muddy, that is when change shines forth like a beacon for all to see. So it is in this story. As this story begins, Henry Crawford has already endured his pivotal changing moment of failure. He was tested in Mansfield Park and found wanting. When he is faced with either taking care of things at his estate as he had told Fanny he would or staying in town to attend a party as his sister suggests, he chooses to satisfy his curiosity and so begins his downfall. The change that he had begun to affect while attempting to court and win Fanny was either merely a facade or rooted in shallow soil and not yet strong enough to withstand a test. No matter the reason, the result was the same. Henry’s change was not of an enduring nature. However, as is often the case, failure can be the very thing that instigates success, and in Henry’s case, as I have written it, failure — painful, agonizing failure — has become the catalyst for his eventual redemption. In the excerpt above, we can see that Henry’s change is more than a facade. He has spent time worrying about Constance’s reputation if she is seen with him. He knows how he is viewed by society, and he would rather take a different path to achieving what he wishes than put her at risk. This means that he is putting someone else’s needs before his own desires, and that marks an important internal change in him. This does not mean that facing any opposition that arises, whether from within or without, will be done easily, but it does mean that those roots of change are not sitting in shallow soil. The remainder of the drive to his home was spent in remonstrating himself and pointing out his weaknesses. So effective was his self-deprecation that by the time he had entered his own library, he wished only for a large bottle of fiery liquid — the fierier, the better — to burn from his memory the image of lips parted slightly, wide blue eyes watching him as he spoke, and breasts rising and falling as her breathing slowed and deepened. She was not a lonely wife or a bored widow. She was an innocent — a respectable, virtuous lady. He crumpled the list she had given him and tossed it into the fire. It would be better for one and all if he once again locked up his heart and went back to pleasing himself as his uncle taught him. It is at this moment when Henry will be required to make a choice. And really, that’s what change boils down to in its simplest form — choice, one solitary choice, made by you and no one else, after another. If you would like to be entered to win the one ebook copy of Henry: To Prove Himself Worthy that I am giving away, be sure to leave a comment below. Giveaway closes at 11:59 PM EST on Tuesday, September 5, 2017. This story it’s so catchy that i’m literally dying to know more!!!! He really was a mess, wasn’t he? His upbringing left somewhat to be desired I think. Glad you liked the excerpt. Oh, my. This story should be amazing. It sounds just like one of those Regency romance plot that I read. A rake who meets a virtuous lady and guides him on how to change his ways and they both fall in love with each other but have obstacles to overcome before they reach their HEA. Thanks for the giveaway, Leenie. I have never liked Henry Crawford and, truthfully, could never see him change. It is a delight to see that he is able to! Thank you for the excerpt and giveaway. Oh, I hear ya! I have felt like that about him until now as well. As I was thinking about reforming him, I considered if it was possible for him to change as needed within the confines of canon. I couldn’t see it happening without the pain he experiences because of his disastrous choice to follow Maria and leave Fanny. That is why I started my story after Mansfield Park ends. Thank you, Carla. 🙂 I’m so glad you liked the story excerpt. Good luck in the draw! How interesting… I always liked Mansfield Park. However, I could never make up my mind if I liked Henry or not. I leaned more toward not… but am willing to give him a chance. So, I look forward to reading this variation on him. Thanks for the generous give-a-way. Blessings on the launch and much success. Leenie, I just finished reading this last night and wrote my review this afternoon! I loved it! 5* from me! I, unfortunately, did notice Gwladys and wasn’t sure if it was a misspelling, however, Trefor didn’t come across that way and I did say it correctly! Thank you for letting me know it was Welsh as I wasn’t sure. I did have one little quibble but not enough to take away stars, was no mention of a chaperone/maid when Henry and Constance went out on their carriage ride. Near the end of the book, a maid was mentioned, but I just assumed it was implied at the beginning. I do love Henry’s struggle. Looking forward to your next one! I’m so glad you enjoyed it, Carole! 🙂 (Thank you for the review!) I was hoping that the consistency of the spelling of Gwladys throughout the book would help readers realize that it was intentional even if they did not realize that it is an actual way to spell the name. 🙂 Congrats on pronouncing Trefor correctly! 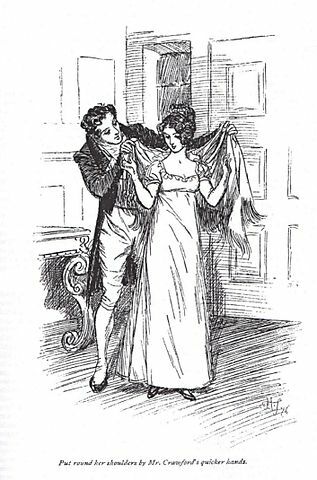 Did you get a chance to cast your vote for who should get to star in the next book in this series of Mansfield Park episodes? I love that you used Welsh spellings for names! Do you think American audiences will know to pronounce the f in Trefor as a v? Really good! I really like the sound of this. Mansfield Park is one of my favorite Austen’s. I know many people don’t like it and when I first read it I thought it was ho-hum but I’ve read it quite a few times since and now I really enjoy it. Would love to win this. I do like continuing stories for secondary characters. Mansfield Park is one of the few Jane Austen novels I saw as a movie before reading it. (I saw the one with Jonny Lee Miller in it. I haven’t seen any of the others.) And after watching it once, I thought “Hmm, that’s kind of an odd story.” So I watched it again, and found it still held my interest. So, I read the book. It is now one of my favourites, and I have read it many, many times over. Henry, however, I have grumbled at every time I have read the book. I may have trouble doing that the same way on the next read through because I came to like this reformed version of him. 🙂 Good luck in the draw! Stories for secondary characters are my favourite type to write. The bad-boy-to-good-husband scenario is always appealing to us ladies. Well done! Congratulations on the new book! I wish I could write stories – but my gift seems to be in the proofreading side, not the writing. :s If you need a final proofreader, I would be happy to help. Thank you for sharing. Thank you, Linda. 🙂 Happy you enjoyed the excerpt. would love to win Henry! thank you so much for the chance! I am very curious to see how Henry can redeem himself. Normally I steer clear of him but I am intrigued by this story. This is my favorite kind of JAFF, the continuation – of one of the side characters. I was very interested in Henry all along, as a flawed character with potential and would love to read your vision of his redemption. I enjoy working with secondary characters — even if they are one of my least favourites, which Henry was when I began this story. However, he has grown on me in this new, improved version of himself. Oh, I can’t wait to learn more of Henry. I don’t know if I will ever like him as much as Darcy, but would like to try.